Arbroath fought back from a 2 goal deficit to grab a deserved share of the points against Table toppers Annan Athletic in a match Annan looked to have secured after going into a two goal lead after 60 minutes but Arbroath bounced back magnificently to wipe out Annan’s lead to set up an exciting last ten minutes where both teams had chances to win the game. Annan boss Jim Chapman made changes to the team which defeated Berwick the previous week with Peter Weatherson and Smart Osadolor given a starting berth. Arbroath were without the suspended Rickie Little . The opening 10 minutes were action packed with chances being created at both ends of the park, Arbroath won a corner in the 2nd minute and in the 5th minute on loan Rangers starlet Darren Ramsay sent in a dangerous inviting low cross which Greig Rutherford was only inches away from connecting with. Almost immediately the play switched to the other end with Wetherson setting up Osadolor who guided the shot narrowly over the bar. Alvarez tested Hart in the 10th minute. With 14 minutes gone Arbroath won a corner after Ramsay skipped past the challenge of Watson wide on the left and from the resulting corner Matty Flynn was at hand to head Andy Munro’s well directed header off the goal-line. 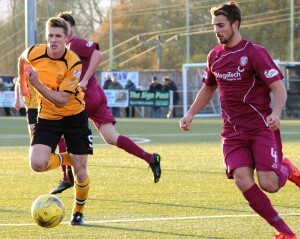 Arbroath’s Bobby Lynn and Craig Wison were combining well down the right. Annan’s Matty Flynn had a fine effort well saved by keeper Allan Fleming and it was Flynn again in the 28th minute who hit a spectacular volley narrowly over the bar from the edge of the box after connecting with an Osadolor cross. Annan were enjoying their best period in the game. Rabin Omar was brought down 25 yards out after skipping past a couple of challenges and from the resulting free kick Wetherson’s free kick pulled out the best in leeper Allan Flemming who pulled off a super save low down to his right hand side for a corner. Omar’s corner was picked up by Flynn and once again the keeper pulled of a good save tipping the effort over the bar. Arbroath looked to have soaked up the Annan pressure but in the 35th minute Wetherson struck the opening goal when Martin McNiff’s header wide on the left was picked up by Wetherson and his low instinctive shot from 15 yards found the corner of the net past the outstretched arms of Fleming. Arbroaths reply was immediate when Swinglehurst blocked Alvarez’s netbound effort. Wetherson started the second half with a good effort which went narrowly over the bar. Arbroath replied when a long ball played from defence caught the Annan defence square and Bobby Lynn latched on t the pass but Lynn’s low shot went agonisingly wide of Hart’s left hand post. The game swung to the other end and Todd’s header form Omars corner went wide of the target. Watson conceded a free kick on the bye line after bringing down Ramsay but the free kick was well defended. Lynn once again skipped past Swinglehurst’s challenge into a promising position but again the shot failed to hit the target going narrowly past the post. Annan increased their lead in the 60th minute when Rabin Omar’s shot from the right struck the post and Osadolor reacted quickly to slip the ball into the middle of the net from close range. Annan looked to have secured the breathing space but within four minutes Arbroath were firmly back in the match. It was their man of the match Bobby Lynn who once again was at the heart of the goal when he collected a long ball on the left hand side before cutting in and finishing with a clinical shot into the net which gave Jordan Hart no chance. Minutes later Hart plucked the ball out of the air as Arbroath pushed forward looking for the eqauliser. Annan were on the back foot Lynn had another effort deflected for a corner kick and form the corner Watson denied David Gold blocking the net bound effort. The subsequent corner was defended for another corner but this time Arbroath struck gold when Greig Rutherford headed into the bottom right hand corner of net in the 79th minute. The Annan goal survived a scare in the 85th minute when Andy Munro headed over the bar following a corner. Minutes later Todd was replaced by Finnie. Rutherford’s shot in the 87th minute hit the side netting as the visitors pushed forward. Stuart McColm’s late introduction in the 88th minute almost snatched the winner for Annan when his effort clipped off the corner of the bar and the post in the 89th minute. As the game entered the final minute Osadolor was denied by an important challenge on the edge of the box. This match like the previous weeks match against Berwick Rangers once again emphasised the competitive nature of this league. Annan have done exceptionally well to get the points on the board and to top the SPFL2 for the best part of 3 months. All the teams are desperately trying to avoid finishing bottom of the league and entering a play off situation and with only 12 points separating top from bottom at this early stage of the season all the places are very much there to be won and lost. ANNAN ATHLETIC : Jordan Hart, Steven Black, Steven Swinglehurst, Martin McNiff, Peter Watson, Stevan Sloan ( Stuart McColm 88 min), Rabin Omar , Mathew Flynn, Peter Weatherson, Josh Todd ( R Finnie 85 min), Smart Osadolor. Subs not used Blair Currie, Ryan McStay, Greig Macdonald, Jamie Watosn, Liam Park. ARBROATH :Allan Fleming, Craig Wison, Jordan Lowdan, Craig Watson,Andy Munro, Mark Whatley, Bobby Linn, David Gold , Greig Rutherford, Sergio Alvarez (Jamie Clark HT), Darren Ramsay. Subs not used Martin Grehan, Jamie Reid, Keiran McWalter, Kane Hester, Calum Broadie GK.